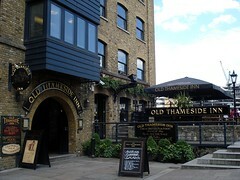 This pub is perfect to enjoy a pint by the river, though its location means it's generally full of tourists. Two rooms with a bar each, downstairs can be booked for events and there is a family area upstairs. The beer is ok with a fair amount of real ale though prices are a bit high. Two TVs on only for sport, largest one being downstairs. Staff are not that friendly unfortunately. Usual Nicholson's menu, food served all day. Last visited by [Aurelien]?, some time in 2007. Info about all-day food taken from sign outside, June 2008. Last edited 2013-05-10 07:41:49 (version 12; diff). List all versions. Page last edited 2013-05-10 07:41:49 (version 12).